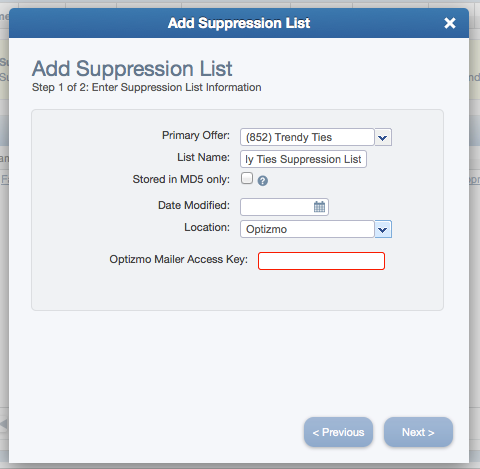 When using Optizmo to manage your own suppression lists, you will begin by entering your Optizmo ONID into your settings. This will allow you to create suppression files in CAKE that will automatically be added to your Optizmo account. Location: Setup > Settings > Third Party Integration Settings > Unsubscribe Settings. Unsubscribe Vendor: Select Optizmo from the drop-down. Optizmo ONID: Optizmo will provide you with your Optizmo ONID. Once you have selected Optizmo and entered your ONID, click Save. If your advertiser has provided you with a suppression file hosted in their Optizmo account, you will add the suppression file a slightly different way, using their Optizmo Mailer Access Key. Optizmo assigned Mailer Access Keys on a per Offer basis, so during this setup you will have to select the specific Offer that the Key is associated to within Optizmo. 2. Select your primary offer - this file can later be applied to additional offers where applicable. 3. Enter a list name. 5. Then enter the mailer access key provided to you by your Advertiser in the Optizmo Mailer Access Key field. Doing this will complete the integration between your advertiser's Optizmo list and your CAKE instance. In the admin, a file hosted on Optizmo will display on the offer card like this with the unsubscribe link dynamically generated by Optizmo. It can, however, be overridden by clicking the Override link. In the Affiliate Portal, a file hosted on Optizmo will display on the campaign card like this with the unsubscribe link dynamically generated by Optizmo and a Download link that clicks through to Optizmo where the file can be downloaded.